Whenever I get asked what my favorite thing to grill is I frequently answer pizza. You typical grill, whether gas or charcoal, produces the perfect intense dry heat that you need for a great pizza. Grilled pizzas are far better than any delivery because you can grill a pizza without grease like the pizza joints do. So make a healthier and better pizza by grilling it. These pizza recipes are the most popular I have and will show you the way to get started making great pizza. There's no better way to cook a pizza than on the grill. This high, dry heat makes it the perfect pizza oven. 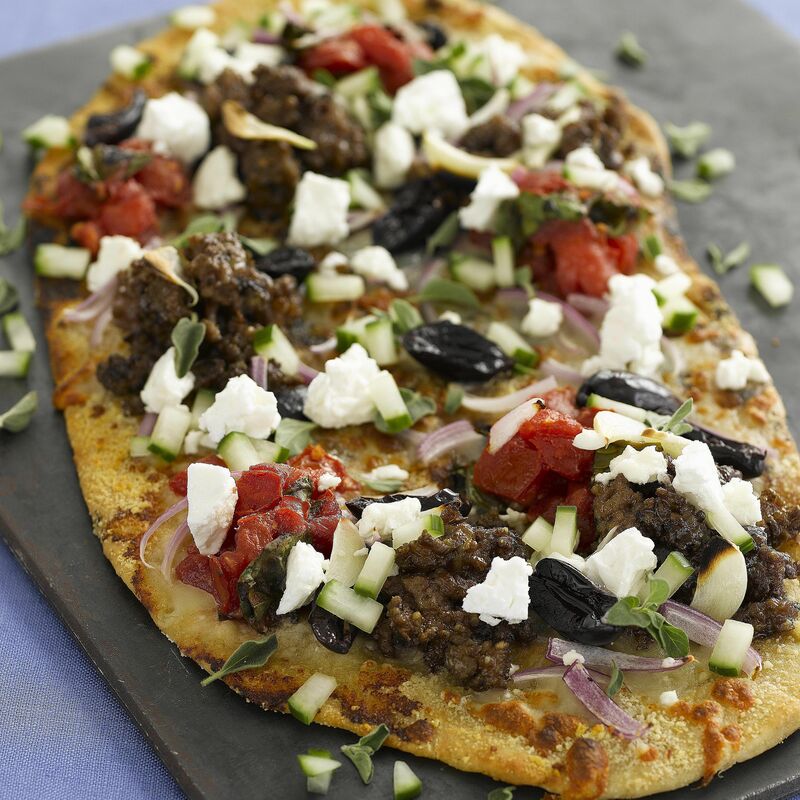 This Greek-inspired pizza is loaded with great flavors and sure to make everyone happy. This pizza is so stuffed with barbecue goodness that a single slice is nearly a meal. Make this for the big game or just big appetites. The combination of brisket, smoked sausage, and pulled pork, covered with barbecue sauce is absolutely fantastic. Kind of a cross between a pizza and a tostada, this Mexican style pizza is piled high with steak or chicken, cheese, tomatoes, avocado, jalapeno peppers and much more. This is a big meal that is fast and easy to make. This is a lively sausage pizza. You can choose a milder sausage if this one is too spicy. The sweetness of figs and the peppery flavor of arugula make a fantastic combination and on this pizza it truly amazing. Use a good, sharp cheese to round out the flavors and this is the perfect, grown-up pizza. This is a traditional Philly-style pizza and has no sauce but is loaded with garlic and topped with roast beef, mushrooms and of course, a lot of cheese. This recipe makes four delicious personal sized Philly pizzas. This the perfect way to use up any leftover barbecued or grilled chicken. Spicy and sweet, this is a great barbecue chicken pizza.